Immaculata Monastery and Spirituality Center has invited the Journey of Hope…. From Violence to Healing to speak to our community/parish congregation on Thursday July 21st at 7 PM. The Journey of Hope is an organization comprised of individuals who have been directly affected by the death penalty either as murder victim family members or exonerated death row survivors. 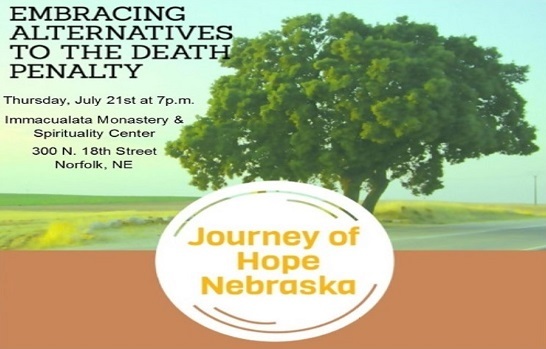 On July 21st, they will share their personal stories and why they stand for alternatives to the death penalty. This is an especially important time to hear these powerful speakers because in November, Nebraskan voters will be asked to decide the future of the death penalty in our state. In May 2015, the Nebraska legislature, with a bi-partisan super-majority, voted to end Nebraska’s death penalty. However, this November, Nebraska voters will decide in a referendum whether or not we retain this law. The death penalty is a difficult topic to discuss and we recognize the need for accountability, especially for grave crimes. At the same time, our criminal justice system must recognize the dignity of every person, and not close off hope and the possibility for redemption. Modern societies do not need the death penalty to keep the public safe and when we resort to killing, we are denying offenders the chance for reconciliation. As people of faith, we are called to something to embrace alternatives to the death penalty.